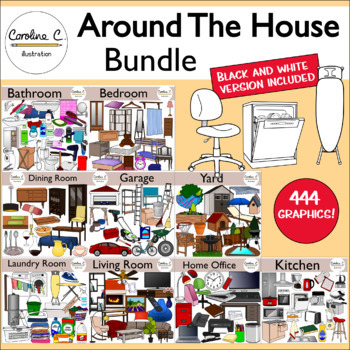 This collection contains 9 house-themed clip art sets. It includes appliances, furniture and other items found in the bedroom, living room, dining room, laundry room, home office, kitchen, bathroom, garage and garden/yard. 222 color and 222 black and white images. .png files saved at 300 dpi.